Locus remembers your last used method and offers it directly when you tap Search next time. 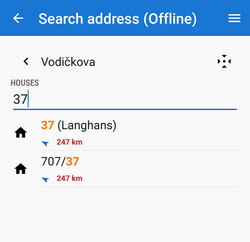 Locus uses Android default Google address search but also GraphHopper and Bing databases are available. Search text - insert address (or part of an address) here. Then tap the blue button. Search results are displayed in a list ordered by the distance from your position. If there is a single result, it is shown directly on map. Locus can search offline addresses in downloaded LoMaps only(beginning with their 2016/04/01 version). If the offline search list is empty you have no LoMaps downloaded or you have not updated them to 20160401 version - download/update them from Locus Store. 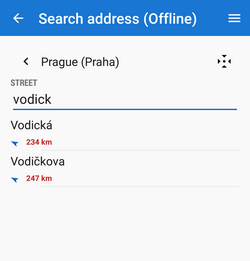 start typing name of the city, Locus offers results, select the right one. Tapping displays the selected item (city, street) on map directly. Recently used/viewed locations, points, places etc. are stored in this tab for future use. With this add-on you can display postal addresses of your contacts on a map. Locus Map reads your contact list, filters items with attached addresses and displays them in a table. Select or search which contact to display on a map. In case a contact has two addresses, both are displayed. 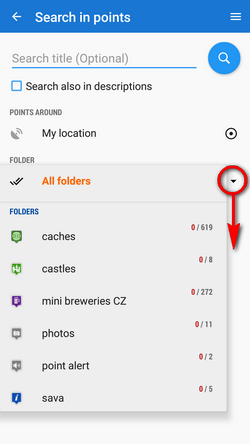 Use this search to find points in your own storage. 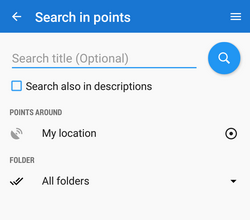 By default this search returns the nearest points located around your current position - just tap . Search also in descriptions - fultext search in all texts related to the point - names, description, geocaching listings etc. - quite a slow method if you have a lot of POIs stored. 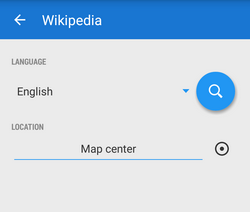 Points around - defines center of searching - current GPS location is default, can be changed by Location selector. 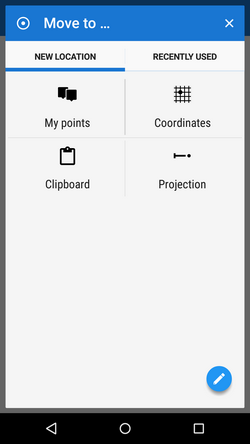 Results are sorted by the distance from the user's location in a table similar to Points manager - here you can select points to display on map, invert selection etc. Use this search to find routes/tracks in your own storage. By default this search returns the nearest routes/tracks passing by your current position - just tap . Search also in descriptions - fultext search in all texts related to the route/track - quite a slow method if you have a lot of routes/tracks stored. 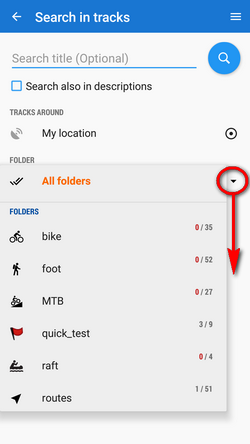 Tracks around - defines center of searching - current GPS location is default, can be changed by Location selector. Results are sorted by the distance from the user's location in a table similar to Tracks manager and it is possible to work with it in the same way - select tracks to display on map, invert selection etc. Locus Map can coooperate with many external applications and their own online/offline databases. Here it is possible to start search in them directly without need to switch the cooperating application directly from the phone/tablet application menu. A typical example can be search of nearest geocaches by the Geocaching4Locus. Search in external databases - Wikipedia, What3words and GeoNames/GNS. Available in Locus Map Pro only. Wikipedia is a free-access, free content Internet encyclopedia, supported and hosted by the non-profit Wikimedia Foundation. Those who can access the site and follow its rules can edit most of its articles. Wikipedia is ranked among the ten most popular websites and constitutes the Internet's largest and most popular general reference work. Location - define place around which to search - use map cursor position or choose location by Location selector. The results are listed in a table of points. They can be displayed on map or imported for later use. Their details contain URL to the related Wikipedia article. The displayed nor imported Wikipedia points do not contain full article texts, only links for their online display. Storing Wikipedia articles for their offline use is not possible. GeoNames- geographical database covering all countries and containing over eight million placenames that are available for download free of charge. NGA GEOnet Names Server (GNS)- the geographic names in this database are provided for the guidance of and use by the Federal Government of United States and for the information of the general public. It contains over 5 million features and 8 million feature names. Databases are updated monthly so the information in it is quite fresh. Offline search - check this option if you have downloaded some GeoNames or GNS databases to your device. Otherwise Locus Map searches online. Both sites provide freely downloadable data files that can be extracted into the Locus/data/geonames directory. The files appear in the GeoNames search dialog afterwards. Select and search 100% offline.